Doctor Robot plush doll from Skelton Crew Studios! I was late posting the news here since i was sharing it around on Instagram and Twitter BUT yeah we made a plush doll of our favorite space monkey! DOCTOR ROBOT! It's a limited release of 150 dolls, with an unhingable jaws and all the extra limbs a Space Monkey could need for hugs! Below I've added the press release and a few photos. And if you want to get your grubby hands on one, all you have to do is head over to the Skelton Crew site. The limited edition fully poseable, fully creepy/cute plush is from Skelton Crew Studio. LITCHFIELD, Maine — He’s the best alien BFF since E.T., and now he’s been brought to life. 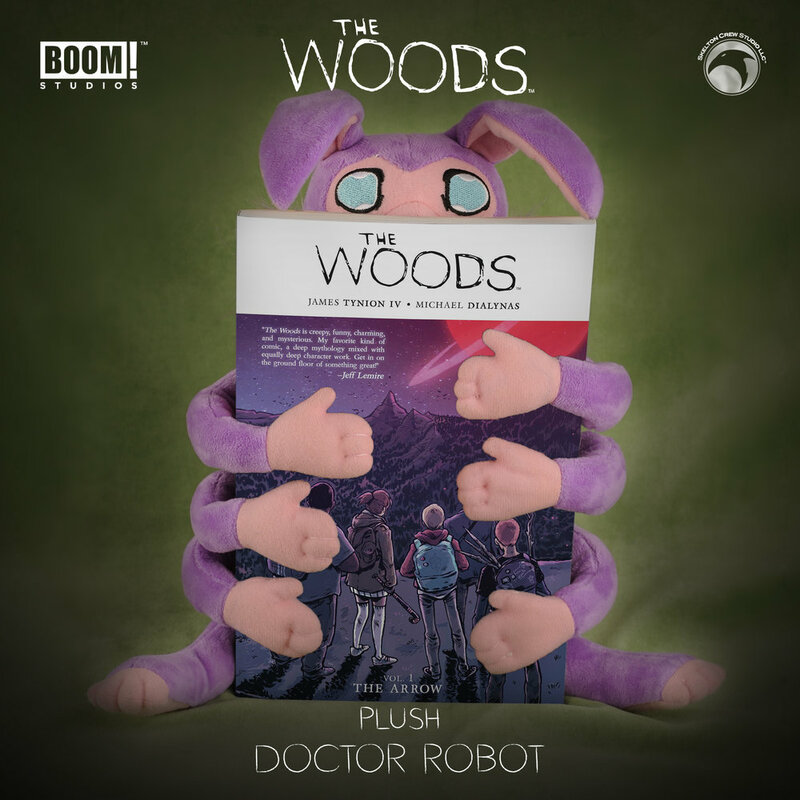 Skelton Crew Studio’s new Doctor Robot plush from Boom!’s hit comic “The Woods” is 18-inches tall from super soft head-to-toe. He features sweet blue eyes, a jaw that’s ready to unhinge at any moment and fully poseable articulation in all eight appendages. He’s also hyper-limited to just 150 worldwide. Adopt one of these alien spider monkeys before July 28 and he’ll come signed by the immensely talented team behind “The Woods,” writer James Tynion IV and artist Michael Dialynas. Doctor Robot, in all his creepy cuteness, ships in the fourth quarter of 2018. About Skelton Crew Studio: A replica and comic collectibles studio located in the wilds of Maine, Skelton Crew Studio has created officially licensed merchandise for best-selling and award-winning comic book series since 2008. It’s proud to work with titles that include “Locke & Key,” “Hellboy,” “B.P.R.D., “CHEW,” “Mouse Guard,” “Head Lopper” and many more. The studio’s been featured on the A.V. Club's Pop Culture Gift Guide, MTV, Nerdist and dozens of other news and pop culture sites. Founder Israel Skelton has been sculpting and creating for more than 30 years. He lives in Maine with his wife Kathryn and two wild little boys. SYFY Exclusive Preview of this years Christmas issue of TMNT! LUCY DREAMING coming to stores January 2019! THE WOODS YEARBOOK EDITIONS coming in 2019! Michelangelo Macro series oversized one-shot out this October! THE WOODS nominated for GLAAD Media Award! LUCY DREAMING #1 Early preview. New series, LUCY DREAMING, coming in 2018! NYCC week 2017 and Where to find me! THE WOODS Final arc covers!